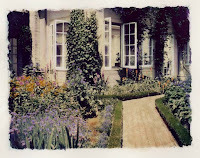 There is a recent post on the Fine Gardening website entitled “Cottage Garden with a Twist”. Aside from having some gorgeous photographs of quaint cottages set amid lush, colorful landscapes, the article has great information on laying out the structure that you need to anchor the casual look of the cottage garden. This includes using rock and brick walls along with pathways to create a hardscape structure, then incorporating water features, trellises, and outdoor furnishings into the landscape. These items, along with the garden cottage as the perfect focal point, surrounded by a selected array of colorful, lavish plantings can create a quaint garden environment for both human and animal visitors.